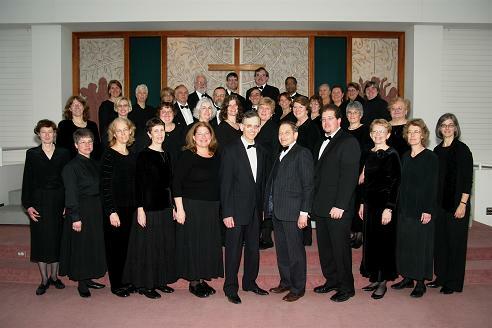 NVC is an SATB non-auditioned community chorus that rehearses in Littleton on Monday evenings. Audition solo parts are often available for those who wish to try out. Currently, the Chorale has about 40 members, who come from towns in the heart of the Nashoba Valley as well as all over the metro-west area of Boston and southern New Hampshire. We perform serious (but not necessarily solemn!) music of all styles and periods under the artistic leadership of Director Anne Watson Born. Our repertoire includes works from Bach and Beethoven to Brahms and Britten; from Vivaldi to Verdi to Vaughan Williams – as well as English madrigals, French chansons, African American spirituals, and a few jazz standards for an occasional change of pace! We present two major programs each year, in December or January and April or May, and we love to reach out to our community by participating in local community events and choral festivals. In 2007, NVC participated in the Jamestown 400th Anniversary Concert in Virginia, and we hope to travel and perform again in the near future. We love making great music together – plus we have fun and we laugh a lot! We are always looking for new members who share our enthusiasm come meet us and our terrific conductor, Anne Watson Born!